Heat oven to 400°F. Spray 8-inch square (2-quart) baking dish with nonstick cooking spray. 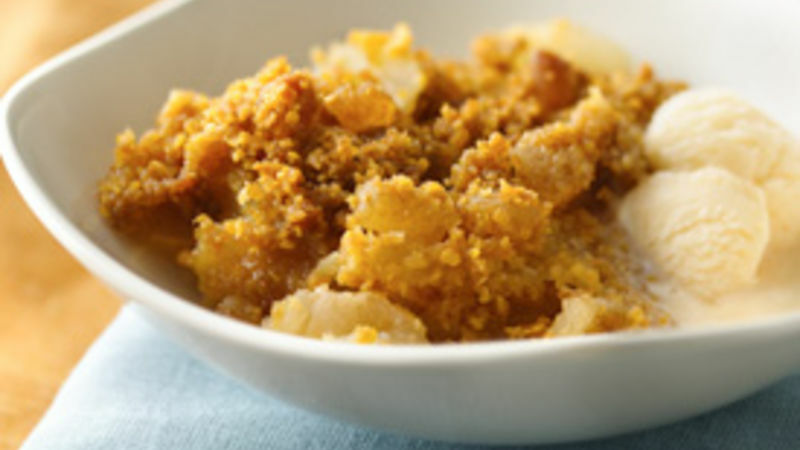 In small bowl, combine corn flake crumbs, brown sugar, flour and ginger; mix well. Stir in margarine until well mixed. Place apples in sprayed baking dish. Add sugar and lemon juice; toss to coat. Sprinkle apples with crumb mixture; press gently. Bake at 400°F. for 25 to 30 minutes or until apples are tender and mixture is bubbly. Cool slightly. Serve warm with frozen yogurt.